Acoustic Sound Baffles, Sound Baffle Panels, Sound Absorbing Ceiling Panels in India With the advent of technology,a lot of new innovative techniques have come up to control the sound and noise that can create havoc in the mind of the people. At commercial spaces like Canteens, Sports stadium, Industrial spots, Malls. Auditoriums etc where it is required to get the control of the sound and a modulation is required to avoid any kind of noise transmission. These days Acoustic Hanging Baffles, as well as Acoustic Hanging Clouds,are in great trend to make the noise reduction in a better way such that there are no more disturbances to the ears of the persons all around. Ceiling Sound baffles are another way that are mounted on the ceiling and reduce reverberation as it can be mounted ceiling. 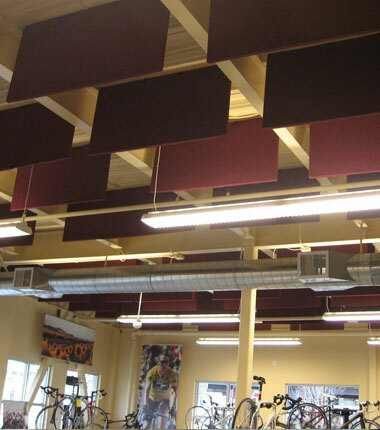 At envirotech you are able to find various kinds and types of sound baffle coverings that have the applications for both indoor and outdoor places. With a hue and myriad of beautiful colours and fabric, the Handing acoustic baffles on the ceiling are great for the industrial use having the outer sheet of A1. It is available in different colors with the hanging systems to be fitted for the vertical suspension and are suspended over the ceiling both in the horizontal as well as vertical ways. The best thing about the Ceiling sound baffles at envirotech is that they are light in weight and will not cause any extra load on the ceiling as well as roof.